Sexually Transmitted Diseases – Cases in Point. Your company decides it wants to produce a more effective program for reducing sexually transmitted disease (STD) rates. The current prevention program in place mails letters to people when they reach 18 years of age and continues to monitor and periodically mail out reminder letters to people who are not married and are between 20 and 45 years of age. For this age range this means that 1.5 million letters are sent per year at reduced costs for bulk mailing, but still costing about $250,000 per year for the mailing, and another $500,000 in printing and administrative costs, costing you approximately 50 cents per letter. The highest risk group is the female population ranging in age from 17 to 36 years of age, with a possible risk group also found in the 48+ year olds for females, 59+ year olds for men. These specific groups of people are targeted, with very different methods taken to interventions targeting men and women, and young to middle aged versus old. Notice there was no need suggested by these statistics for targeting nearly all middle aged men and all women between the ages of 37 and 48. The result of this review should be to redirect the costs of your intervention program, allowing it to more effectively target age-specific group types. Chances are your method of engaging in these activities will adapt the traditional mailing method, but more selectively choose the types of members you mail to, cutting the cost for this mailing in half. This money can then be redirected at targeting older people married or unmarried, either through bulk advertising means or by way of selecting the highest risk individual based on marital status. Numbers play a very important role in the types of plans that can be developed for condition or disease prevention, monitoring and maintenance. During an early planning stage, the plans for implementing a prevention program for a fairly gender-specific condition like pyelonephritis by default may be likened to similar programs out there regarding the prevention of fairly common STDs such as syphilis, gonnorrhea, herpes, or AIDS. However, each of these diseases has unique age-gender distributions implying that disease type or class alone is not always the best way to design programs, and pyelonephritis has features other than sexual activity to consider when designing an effective health education program with the goal of reducing pyelonephritis incidence and prevalence during the child-bearing years. We wouldn’t for example utilize experiences from an adult or mid-child age inoculation program to design an intervention program targeting 0-2 year olds. We might make use of the first two programs to provide important insights into program planning, but in the end it is the actual data and statistics that tell us which is the best way to design such activities. For this reason, the above age-gender pyramid tells us more than other STD programs about how to develop age-gender specific activities and written materials for preventing future disease onset. Many if not most ICDs demonstrate differences in chronic versus acute case distributions in the pyramid. Still, a number of ICDs demonstrate little to no difference between incidence-prevalence age-gender curves. 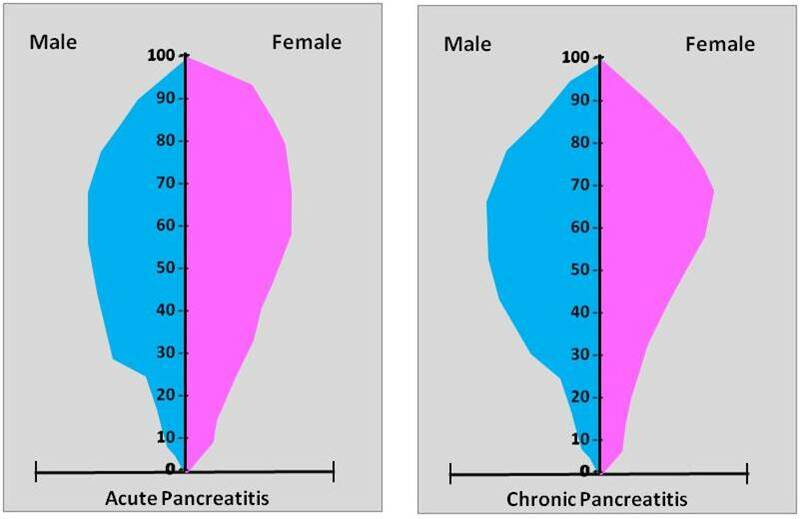 Acute versus Chronic Pancreatitis is one of the better examples of this statistical behavior. Chronic diseases with 3 or more levels demonstrate significantly more diversity in age-gender behaviors and usefullness in predicting long term outcomes. Whereas there is a limited relationship between defining a disease state as acute or chronic, conditions preceding certain disease states do show age-gender differences that are useful in evaluating population health. 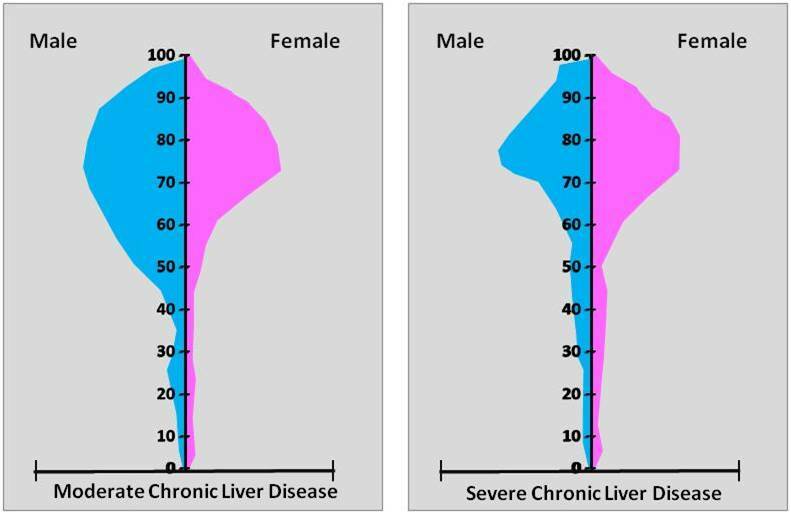 The distribution of cases of several chronic versus very chronic liver diseases is one example of this. The diagnosis of hypertension, either simple or with comorbidities, and renal failure and its predecessors are other more definitive examples of this ICD disease group pattern. 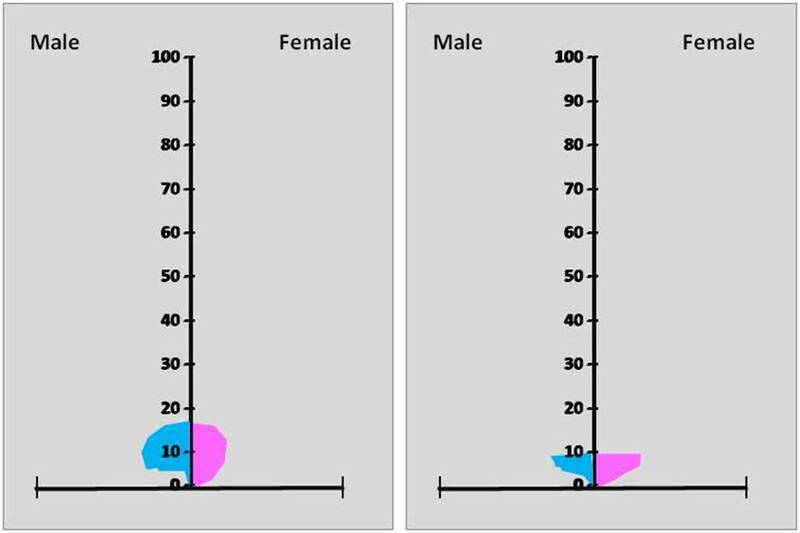 The way these graphs are calculated and produced, they structures have a tendency to demonstrate gender crossovers or intergender migration of the ICD being evaluated. This results in graphs in which only one gender is affected by a condition during a particular periods of age . When total numbers of cases are small, this might be explained as a result of small n and large variance. But these undulations are seen as well for larger n’s as well, suggesting there is another cause for this phenomenon. The examples above in the top row are for very popular conditions, some nearly extinguished over time. 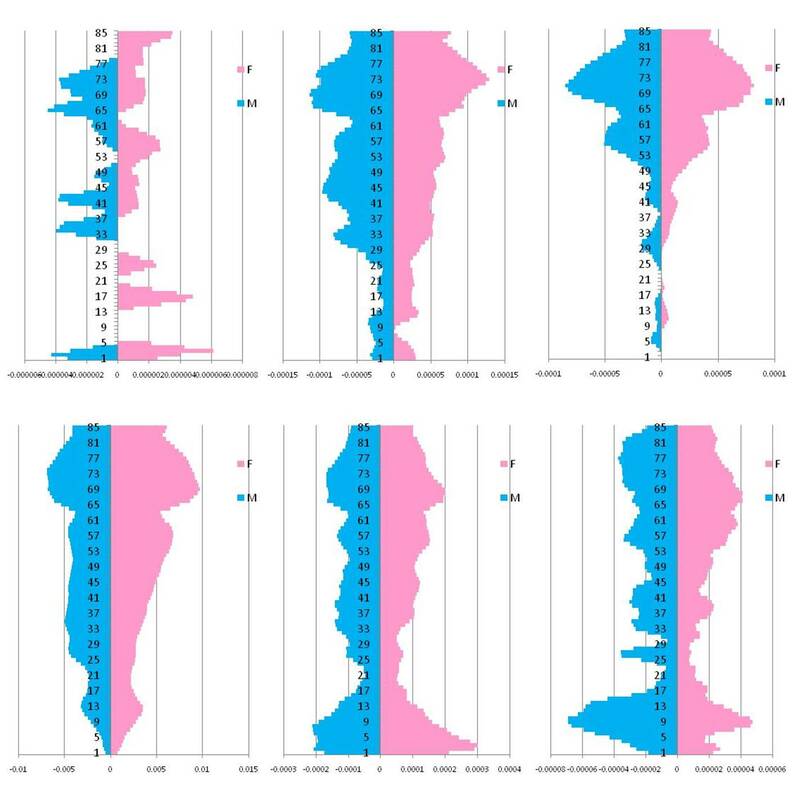 The alternating male-female pattern change suggests a possibility for gender specific genome-related changes for the organism responsible for the condition, i.e. preference for one gender over the other, cycling back and forth during the final years of existence. Age-Specificity. Another very common anomaly of these graphs is systems-induced. The systems effect related to the rules established for defining the ICD for a particular cases. With ICDs, there are two very distinct sets of rules used to categorize a disease pattern by removing the possibility of age-randomized ICD assignment. Some ICDs pertain only to children <18 years of age. Others are ICDs which are somewhat humanized and subjective in that the way the diagnostician assigns the subcategory based on interpreting the medical record. This subjective definition and assessment of outcomes is also true for a number of birth-defect related biological-behavioral, psychological and a few psychiatric disorders, for which mild, moderate and severe levels need to be assigned. Severity of Down’s syndrome and a number of genetic diseases may fall into this category of outcomes definition. To help further substantiate the ICD for many of these ailments or conditions, guidelines are typically established and use to prevent misdiagnosis and miscategorization of severity for most of the diseases. In the case of Mental Retardation for example there are three levels of disability that are categorized, with specific sub-topics or features used to define the ICD down to the ###.n level. There is no age-related categorization involved in this ICD defining process, so age distributions may show a tendency for the cases to be primarily evidence in younger age groups, but this is due to morbidity-mortality aspects of this kind of condition. For this reason, early deaths are not unexpected and therefore early reductions in incidence-prevalence expected for amny of these individual. Even more so important to note are the secondary conditions taht accompany these diagnoses. Mental health, inherited cardiac anatomy and functionality states, inherited hormone and cognitive differences, all add to the complexity of these conditions and are responsible for their short-lived tendency for many ICDs. The types of conditions demonstrating this fixed range outcome are not always predictable. For some reason, child abuse for example has patients with claims identified for this diagnosis who are unexpectedly common in ages well past childhood. This infers not only a past history of child abuse, resulting is later inclusion of this ICD in the records due to later events that took place in someone’s life, but also suggests the possibility of some selective filtering of how and when to use this child-related diagnosis for patients who are no longer in that age span. It is very uncommon to see this type of behavior by diagnosticians present itself for other childhood related conditions, a history of which remains underreported. One of the more noticeable ICDs in the above list is that for pyromania. 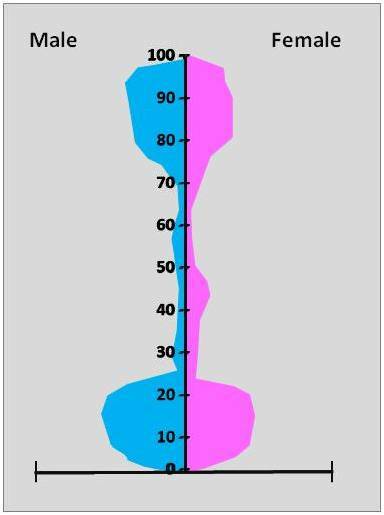 This is a very rare event for females, and for males, its prevalence is strongest with two peaks in childhood. Until now, it was possible that many of the ICDs registered in a medical record consisted of ‘rule-out’ as one of the major reasons the ICD is noted. For example, whenever a patient interacts with a PCP or specialist due to the possibility of his/her manifesting this psychological syndrome, we expect to see the ICD at times noted in medical records where the family practitioner recommended the patient to a psychologist or psychiatrist with the goal of ruling out this mental health condition. In such a case, it is possible that this ICD will be registered under a patient’s ID twice, once by the PCP and again by the counselor or pscyhiatrist. 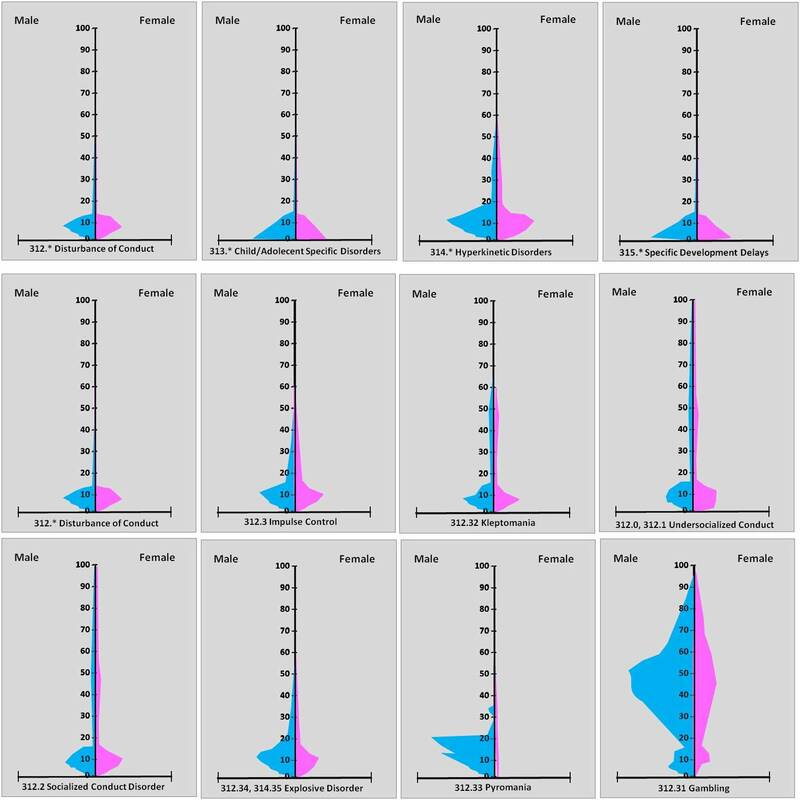 With many childhood diseases, this weighting effect the ‘rule-out’ visits have on outcomes may in fact be the reason a large number of population pyramids demonstrate these bi-gender peaks of around 14-17 years old. This bigender trait is not seen for pyromania, suggesting either there is an obvious monogender relationship between this disease and childhood mental health, or that this tendency for introduction of error due to rule-outs is actually fairly rare in the records. In the following series evaluated of childhood behavioral ICDs, two gender specific behaviors are noted. The pyromania is monogeneric; gambling is male-dominant, with prevalence progressing well into the adult years. Explosive disorder demonstrates a tendency to be more male-linked. Note also that impulse control and kleptomania are bigender behaviors. Undersocialization begins earlier or is diagnosed earlier in young girls versus young boys. Both Gender and Culture are reviewed extensively on another page–focused on socioculturalism and ICDs. Certain forms of abuse are very age-gender specific. The above figure pertaining to the age-gender prevalence of gambling illustrates a feature seen in other human behavioral problems. The gambling ICDs closely resembles the ICD for alcoholism and smoking. This supports the past claims that AA programs designed to assist in alcoholism have their related similars related to gambling addicitions and drug addictions. If we take a close look at the drug addiction IP pyramids, we see some very specific age-differences based on drug type, variety, street related history of use and popularity of slang names and brand names, and cost. For another set of subjectively defined levels of disease, with very qualitative aspects sometimes overly-quantified as part of the diagnostics, we find the psychiatric conditions at times fit into this category of system-related ICD evaluations. Bipolar behaviors for example, manifest themselves clinically as one of several levels of complexity. The patient can be primarily manic, depressed, or a mixture of these two at two different levels of behavior and complexity. People experiencing must be evaluated in details in order that the right ICD defining their condition be identified, even then, this ICD may only be valid for short period in time and may be completely different the next time an office visit takes place. What is most problematic about this psychiatric diagnosis, as well as several other psychiatric diagnoses, is the fact that this particular psychiatric ICD, requires a highly subjective decision to be made by the diagnostician. This routine often results in outcomes that appear very much like other conditions which are diagnosed as either acute or chronic. At times there is no difference between these two ICDs. Overreporting is when people overreact to the potential of experiencing a medical condition, thereby increasing their participation in care related clinical activities. The pseudo-hypochondriacal approach to care is only occasionally displayed at the adult level, and seems to involve specific physiological and psychological, behavioral or even psychiatric conditions. These events are more likely to take place involving children, and logically relate to the parental’s attitudes and responses to a child’s condition. Most of the time, parents overreact to conditions as an act of safety and ‘best care’ related concerns. This results in the peak often seen in the teenage years for many of the ICDs, in particular when the peak is not gender specific.